Time to get your marbles on the track and have a ball! 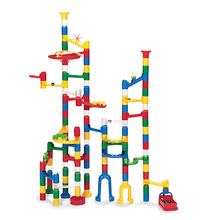 Thanks MindWare Toys for sending me the marble run to review. All opinions expressed are 100% mine and I was not paid for this review. As soon as the box arrived my kids were thrilled. The agony my kids endured when I said we could not set it up until we got back from our weekend get away. My husband is a good dad and spent an hour setting up the marble run. The kids faces were filled will awe as they watched intently as the marbles went on the course. The suggested age for this educational toy is 4+ but I still allowed my 2 year old to play with his sister with constant supervision, but in typical 2 year old fashion the marble run took a small beating from my son and I found myself trying to re-hook the pieces back together. The next time we set it up will be when my son is napping so my daughter can have more time of exploring and learning as the marble goes through the different runs. Time to enter the giveaway and surprise your little one with hours of fun and exploration. Use the rafflecopter form below to get your entries in! The Keva Structures 200 plank box. They have these at a local museum and my kids love them. I really like the Imaginets! I think our little boy with special needs would love them! I like the Marble Run for my son. I'd love the Let's Play School Set! Also, we love Qwirkle!